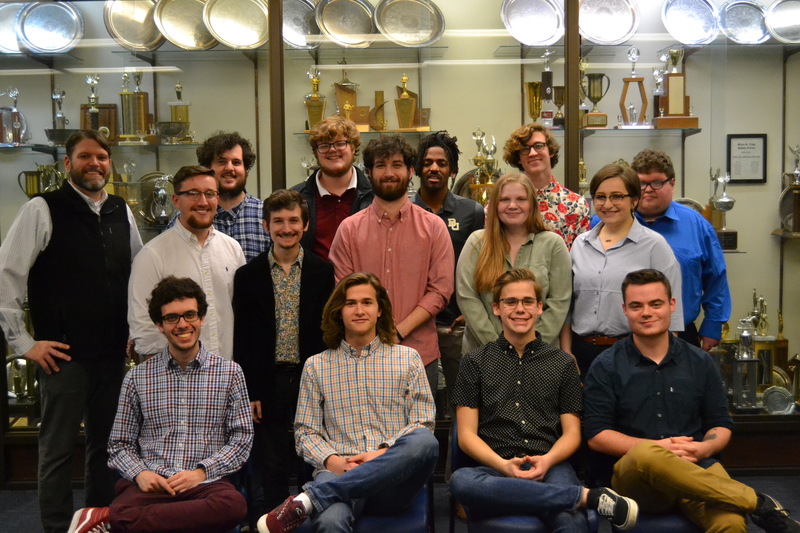 Baylor Debate turned in a dominant performance with a 21-3 record at the Mid America Championship (MAC) and the 2019 NDT District 3 qualifying tournament, with teams advancing to the National Debate Tournament. With a 7-1 record, Baylor’s dynamic freshman debate duo of Collin Smith and Tony Wyatt won first place at the Mid-America Championship. 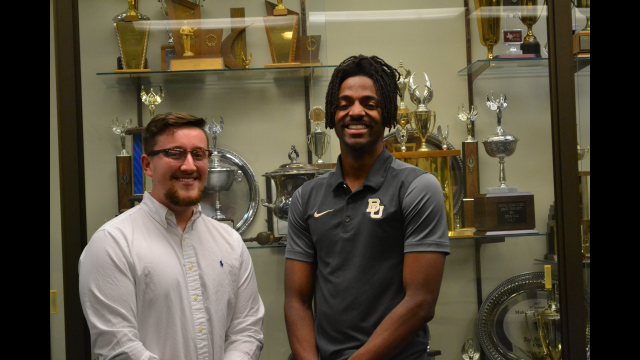 Baylor’s team of Alec Ramsey and Elan Wilson posted a 7-1 record, placing second at the District 3 qualifier and moving on to the National Debate Tournament. 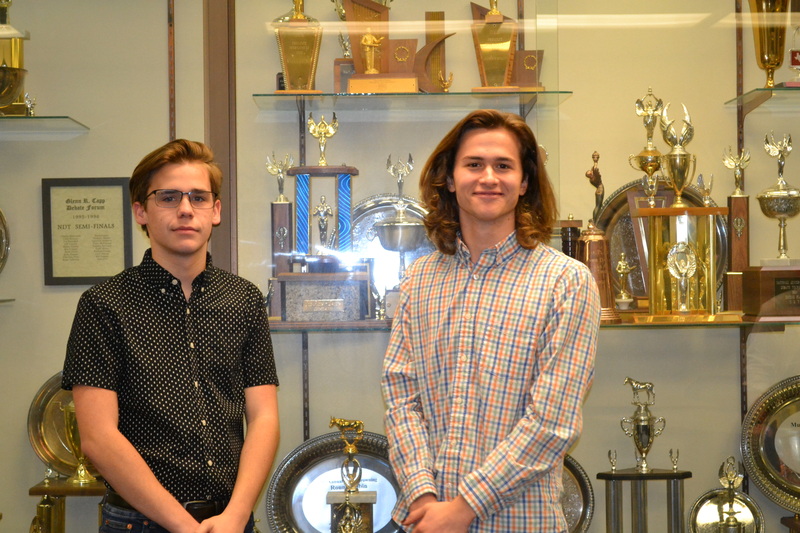 Baylor’s team of Jonas Thrasher-Evers and Greg Zoda qualified for the National Debate Tournament with a 7-1 record at the District 3 qualifier. 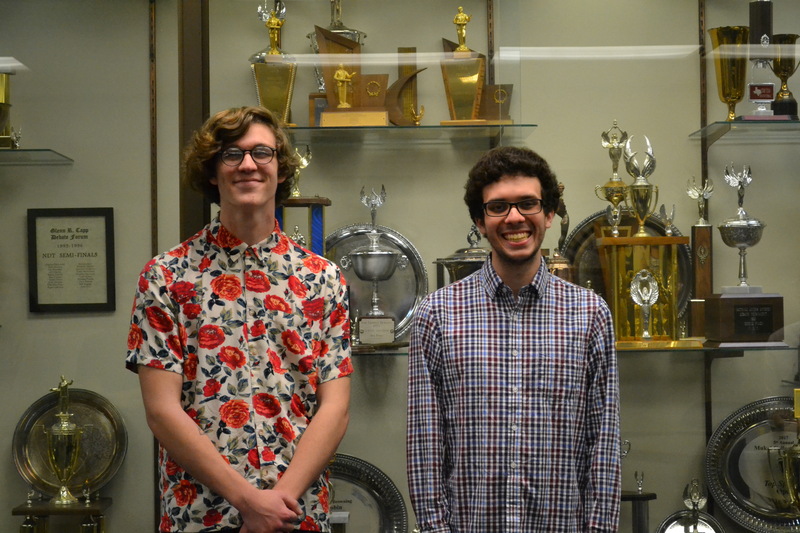 Baylor Debate turned in a dominant performance with a 21-3 record at the Mid America Championship (MAC) and the 2019 NDT District 3 qualifying tournament held Feb. 22-24 at the University of Central Oklahoma. Baylor Debate is the oldest co-curricular activity at Baylor, dating back to 1845 – the year Baylor was chartered by the Republic of Texas. 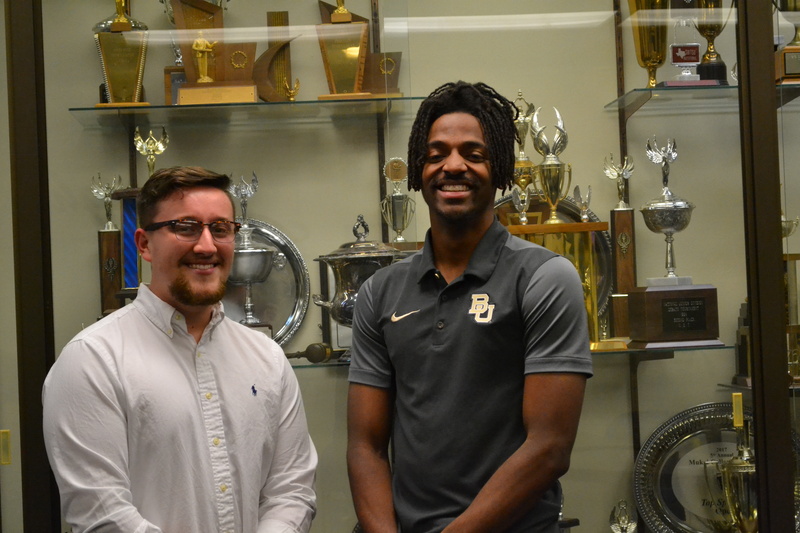 With a 7-1 record, Baylor’s dynamic freshman duo of Collin Smith and Tony Wyatt won first place at the Mid-America Championship, defeating teams from the University of Texas at Austin, University of Kansas, University of Oklahoma and Wichita State University to capture the tournament. 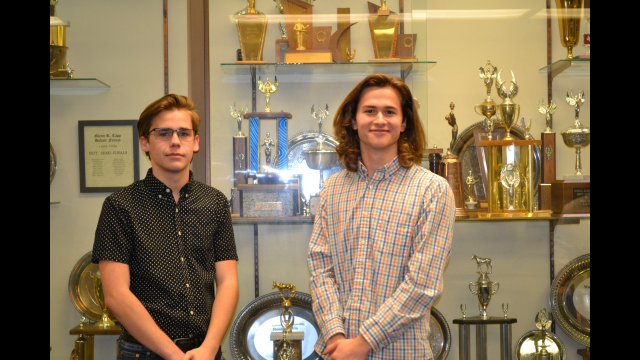 Smith, a freshman professional writing and rhetoric major from Cabot, Arkansas, and Wyatt, a freshman journalism major from Lindale, Texas, were among the nation’s best high school debaters last year. They came to Baylor to compete for one of the oldest and most successful college debate programs in the country. Baylor Debate also won second and third place at the District 3 qualifier, the tournament which determines qualification for the national championship. Placing second was Baylor’s team of Alec Ramsey, a junior anthropology major from Lindale, and Elan Wilson, a junior political science major from Pflugerville, Texas. 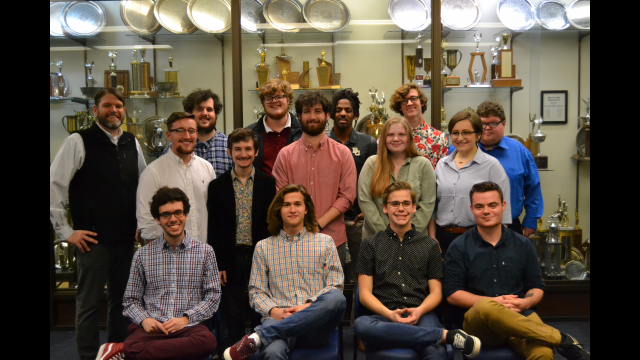 Ramsey and Wilson posted a 7-1 record while defeating teams from the University of Texas, Trinity University, University of Missouri-Kansas City and Wichita State on their way to qualifying for the NDT. 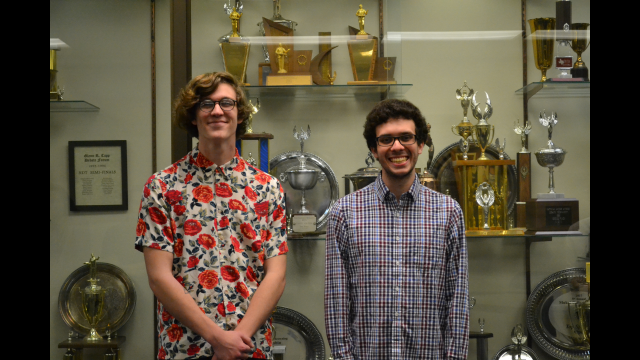 Also qualifying for nationals and posting a 7-1 record was Baylor’s team of Greg Zoda, a senior political science and communication major from Nashua, New Hampshire, and Jonas Thrasher-Evers, a sophomore from Tyler, Texas. Zoda, one of the nation’s most accomplished debaters, is on a winning streak. His combined record at the past three tournaments, including the highly competitive California swings held at the University of Southern California and Cal State Fullerton over the winter break, is an astonishing 20-2. “Greg has been the research backbone of the Baylor Debate team for the past several years. He is one of the most well-read debaters and best speakers I have ever coached,” said director Matt Gerber, Ph.D., associate professor of communication and The Capp Chair in Forensics in Baylor’s College of Arts & Sciences. Gerber has directed the Capp Forum since 2006. Debate – and the ability to be an effective advocate – is more important in today’s society than ever before, Gerber said. Debate teaches the kinds of critical thinking and evidence-evaluation skills needed to wade through a morass of facts and opinions and differentiate between good and bad public arguments, he said. “Debate at the intercollegiate competitive level ramps up this deliberative process to 180 miles per hour and follows a rigid set of rules and time limits, where teams from across the country compete against other and are critiqued by highly trained judges, who usually have Ph.D.’s in argumentation, rhetoric, political science or a related field,” Gerber said. Baylor has won three national championships in debate and appeared in nine Final Four competitions since the NDT began in 1947. In 2018, Baylor Debate advanced to the NDT’s Sweet 16 round, finishing the season ranked 11th in NDT varsity points and first in their Cross Examination Debate Association (CEDA) region. The debate program contributes to Baylor’s transformational undergraduate experience by bringing together undergraduates in majors from across the curriculum, from communication, political science and philosophy to astrophysics and chemistry. Although they have different academic paths, the students share a passion for public deliberation and debate and enjoy the opportunity to represent Baylor across the nation against the highest levels of competition. Following the NDT, the Capp Forum will host a public debate on campus in April. The program also hosts a Summer Debate Workshop from July 14-20, which includes a Debate Policy Workshop that emphasizes research and skill development on the NSDA/UIL policy debate resolution for the upcoming season and a Lincoln-Douglas Debate Workshop that provides students with an intensive, skill-specific experience on the upcoming high school Lincoln-Douglas debate topic. For more information, visit www.baylordebate.com or contact Gerber at Matt_Gerber@baylor.edu.